High QuailtyThe large pencil case is made of nylon material,light weight,durable and not floppy, provides great protection against dust, scratches and bumps. With four strong zippers,easy to open and close. Large Capacity8.3Lx3.6Wx2.4H(inches),perfect size pencil box. Two big inner pockets and one pockets on front cover,lots of room,stores a variety of stationeries as well as small items and gadgets. 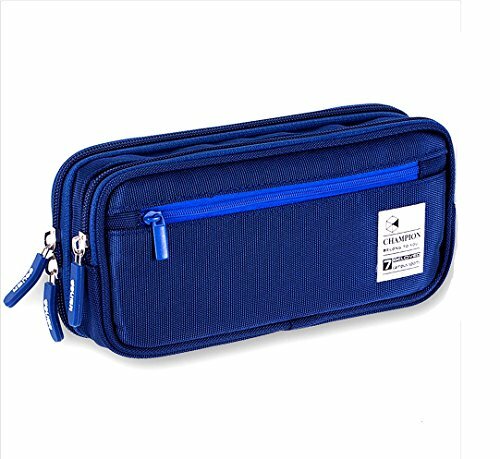 Sophisticated Inner structureA big main pocket fits longer pencils or longer items and other one is a multifunctional pouch with three mesh pockets and a small bag,keep important small notes, cards, and tickets in an easy-to-view compartment. Formal Design Suitable for both office & school use and good for people of all ages.Choose from 3 colors(BlackDark BlueRose Red)Ideal for girls&boys to choose the like one. Satisfaction GuaranteedAny problem about MontoSun pencil case, feel free to contact us, we will guarantee a resolution,a good customer service always here for you!